Yesterday, I almost let the hatred of some cyber bullies get to me. Yesterday, I ALMOST believed them. 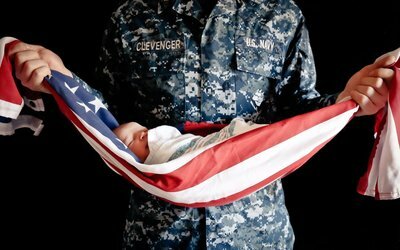 I posted a picture that I had recently taken of a military man holding his newborn son in a vinyl prop flag that I purchased at The Dollar Store. I love the shot. The family loves the shot. Most of you loved the shot. I almost let these cyber bullies get me yesterday. I could have easily deleted the picture off of my business page and ended it with that. I almost did. Then I thought, WHY? These cyber bullies would win! So I went to the group and I stood up to them. I stood up for what I believed in! And you know what, so did so many others! A photography group saw the picture and agreed there was nothing disrespectful about it and went to the page and stood up for it. Friends, who I didn’t even say anything to, somehow saw it and went and stood up for the picture. The HONOR of the picture. In the last 24 hours, the image has gone viral. From my business page, over 12,000 people have seen the image. This morning, two local reporters have contacted me wanting to talk about this image and the affects of cyber bullying and pages like this. I didn’t ask for any of this. I just took a picture. But, I stood up for the picture. To me, that is what being an American is about. What started as this horrible group sharing this picture in hate, turned into a viral picture that was being seen literally all around the world! I had calls from Bahrain, Australia, Canada, and Guam, all reaching out to me over this photo. After my first segment on Fox and Friends, that's when it became national! To date, this video on Fox and Friends Facebook Page has been seen by 1,412,315 Views, and shared over 17,231 times! From there, I feel like every news outlet was talking about it, from Good Morning America, The Today Show, CNN, Huffington Post, you name it, it was on there! It was even trending number 1 on Facebook for some time! I was blessed and shocked when Fox had called me that weekend, and wanted me to go to DC that weekend to do two follow-up segments! When I look back on these past two weeks, I have continued to state how all of this started from hate, this hate group, who thankfully has been shut down since them, they wanted to tear me down. All of this happened because I decided to take a stand. I would have never imagined this to go viral, be in newspapers, etc. I think that just goes to show that you never know when one decision could change your life. While I am so honored for all of this that happened, I am really happy and excited to get back to my "new normal" and back to doing what I love, which is taking pictures and helping families preserve their memories. Thank you all for your support. The thousands of emails and messages I've been going through shows that the majority of people have been in support of this image, and that means the world to me! "My family still gushes over how amazing she is and how wonderful it was to have her capture our special day."